Orkut was the result of a “20 per cent project” in which Google workers got to spend a fifth of their time on ideas not necessarily related to their job responsibilities, this is half true but anywaz Google really didn’t make huge profits with the buyout as such. Orkut proved particularly popular in Brazil, where two years ago it was eclipsed by social networking powerhouse Facebook. Google launched its Google+ social network in 2011 and has been slowly weaving it into other services. This is a big news to other social networking site offcourse Facebook which is going to gain some good traction in countries like India, Brazil and more.. If not big atleast few 100 thousands of new users spilling out there considering the over engineered google plus.. So RIP Orkut.. Its through Orkut that many started ther social networking journey; but sadly it could not compete with Facebook. 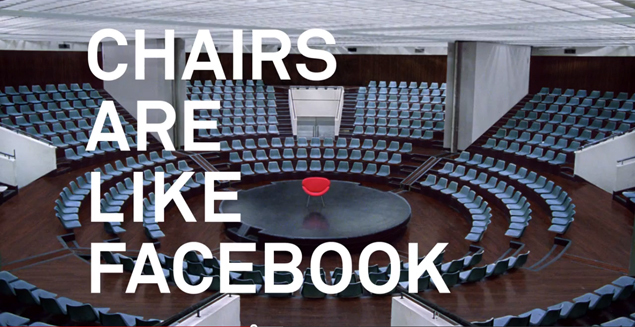 This Facebook Ad a Great IKEA commercial !!! I was watching this video randomly & almost till the end I was thinking it was an IKEA commercial selling chairs.. and that very serious voiceover lady was depressing the living crap out of me telling that Facebook is humanity’s only hope against the dark universe, Facebook has over 1 billion active users and I heard later this ad was made to embark it… titled “Things That Connect Us” compares Facebook to chairs, bridges, basketball and other vehicles that bring people together. The social network as hired ad agency Wieden & Kennedy, best known for its Nike work to create that 90-second film. Ironically, there is no mention of Facebook hitting the 1 billion mark in the film. Com’n Facebook u very well know that every user has a different relationship, as a tech blogger I know technology is a little piece of magic that can define how we interact with the world and with ourselves.. and if u want to take a more active role in making money from those users, it makes sense to start defining the company’s role in every one of those relationships. To see a company that’s done that incredibly well, look at Google. Bring the narrative under one roof, and you can start to steer it. This ad makes it clear that Facebook needs to do a little work defining that narrative and define yourself as yet another service or product & gags to the riches selling relationships..
Just last week announced its Facebook App Center, currently more than 600 apps are featured in the App Center. These apps are not new, and are already able to sync with your Facebook account, should you let them. but it wasn’t immediately clear how users would benefit, or whether it simply added another layer between you and apps you download to your smartphone. 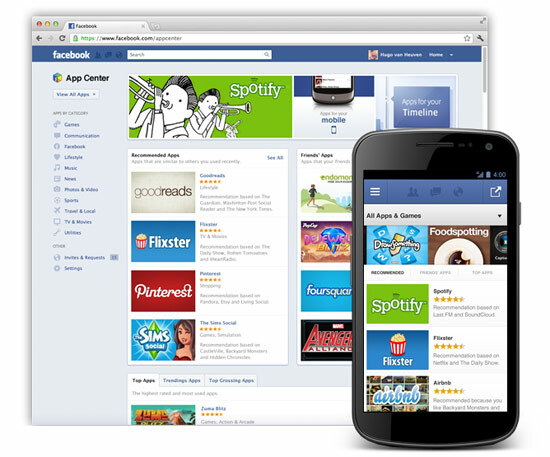 So now you can go to Facebook.com/appcenter, and choose apps you want to download on your Android or iOS device. Those apps then show up as notifications in your Facebook mobile app. Click the notification and it will take you to the regular app store on your phone so you can download the app in question. But you still need to go back to the Facebook app to authorize the app you just downloaded. When you access an app on your phone that you synced with the Facebook app, and one of your Facebook friends visits the App Center, it will show your friend which apps you use. In that sense, it’s more like a recommendation center than a store. For newbie smartphone owners, this might be useful for finding popular apps. There are numerous app review sites, but this would be a place where users can see which apps their friends are using. You can see what apps are popular with Facebook users in general. We all know Facebook filed its IPO setting the stage for the internet industry’s biggest coming-out party and one of Wall Street’s most hotly anticipated events of 2012, with a valuation of over $100 billion. Here is a look at some of the personalities behind the world’s largest social network. We all know Zuckerberg, portrayed as a brilliant, ambitious and ruthless empire-builder in the 2010 movie “The Social Network,” founded Facebook with Chris Hughes, Dustin Moskovitz and Eduardo Saverin while at Harvard University in 2004. The 27-year-old frontman, who has repeatedly said he was in no rush to go public because that might distract employees and dilute his control, decides the direction and product strategy of the company. Forbes estimates Zuckberg’s net worth at $17.5 billion, making him the 14th richest man in the United States. The billionaire Stanford alumnus and former Wall Street trader was Facebook’s first outside investor and director. Thiel co-founded online payments service PayPal and sold it to eBay Inc for $1.5 billion in 2002. 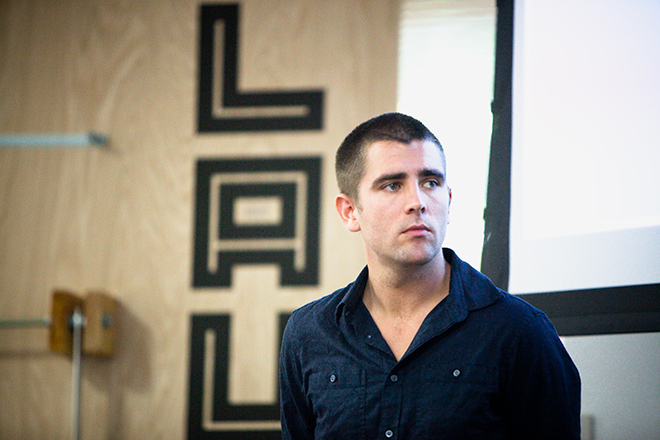 Cox organizes Facebook’s product strategy and oversees product management and design. A former Amazon.com Inc manager who helped develop the “Kindle” digital book reader, Rose oversees Facebook’s partnerships, forging ties with Hollywood film studios, game makers, mobile phone companies and even carmakers. Rose also takes the lead on mergers and acquisitions. Fischer is responsible for much of Facebook’s vast and highly profitable advertising network. He runs sales, advertiser marketing and customer operations. 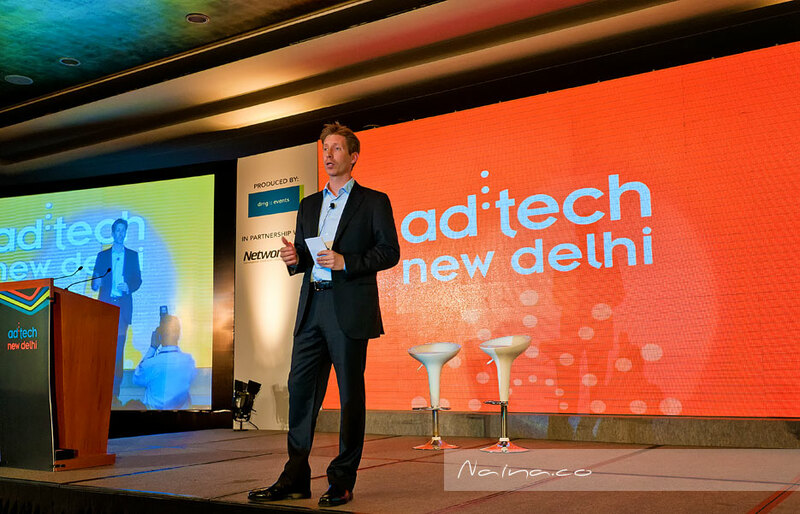 During seven years at Google Inc, Fischer helped build that company’s online ad network into the largest in the world. Before that, he was deputy chief of staff at the Treasury Department during the Clinton Administration. 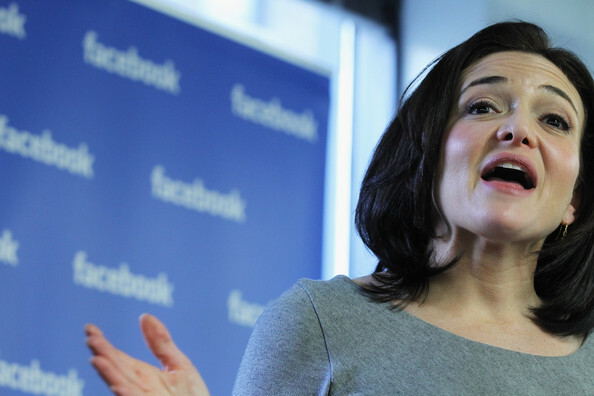 Sandberg, one of the most powerful women in Silicon Valley, oversees business operations including sales, marketing, business development, human resources, public policy and communications. Another former Google employee, Sandberg built and managed Google’s online sales channels for advertising and publishing and operations for consumer products. Before working for Google, she was chief of staff at the Treasury Department under President Clinton. If you were thinking logging out of Facebook means the social network can’t track what you’re doing online? Think again..
An Australian technologist Nik Cubrilovic, recently claimed that when the user is logged out of Facebook, rather than deleting its tracking cookies, the site merely modifies them, maintaining account information and other unique tokens that can be used to identify its users. So Even if you are logged out, Facebook still knows and can track every page you visit on the web. Even Facebook admit that it alters, but does not delete cookies when users log out. 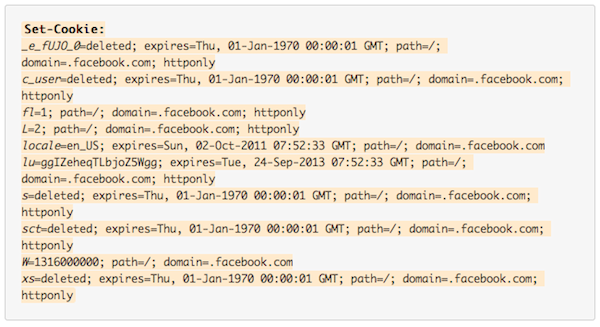 After running a series of tests analyzing the HTTP headers on requests sent by browsers to facebook.com, we can easily see that Facebook alters its tracking cookies the moment you log out, instead of deleting them. Since your uniquely identifying account information is still present in these cookies, Facebook can continue to track you. With my browser logged out of Facebook, whenever I visit any page with a Facebook like button, or share button, or any other widget, the information, including my account ID, is still being sent to Facebook. The only solution to Facebook not knowing who you are is to delete all Facebook cookies. You can test this for yourself using any browser with developer tools installed. It is all hidden in plain sight. This will supposedly limit your usage of the social network to just facebook.com. If you need to use it on another website, you can temporarily whitelist it with the AdBlock switch. If what Cubrilovic found today ends up being true, this could be a serious problem for Facebook. The advice is to log out of Facebook. But logging out of Facebook only de-authorizes your browser from the web application, a number of cookies (including your account number) are still sent along to all requests to facebook.com. Even if you are logged out, Facebook still knows and can track every page you visit. The only solution is to delete every Facebook cookie in your browser, or to use a separate browser for Facebook interactions. To make it easier to see the cookies being unset, the names are in italics. If you compare the cookies that have been set in a logged-in request, and compare them to the cookies that are being unset in the log-out request, you will quickly see that there are a number of cookies that are not being deleted, and there are two cookies (locale and lu) that are only being given new expiry dates, and three new cookies (W, fl, L) being set. This is not what ‘logout’ is supposed to mean. Facebook are only altering the state of the cookies instead of removing all of them when a user logs out. The social networking giant said that the logged-out cookies are used to identify spammers and phishers, detect when an unauthorised person is trying to access a user’s account, help users regain access to an account when it’s been hacked and disable registration for underage users who try to re-register with a different birth date. I know many of you are using it already, since everyone as an gmail account and netizens can forget there name but not there gmail ID.. It’s now been just a few days since Google launched its Buzz social-sharing service and started rolling it out to Gmail users. The feature will pit it against social networking sites like Facebook and Twitter. Google Buzz will allow users to quickly share messages, Web links and photos with friends within its popular email service Gmail. Google Buzz comes after the company’s several not-so-successful attempts to strengthen its position in the hotly-contested social networking space. Here’s looking into what all Google Buzz will do for users. If most of you are already using gmail I am sure you are seeing that new tab for Buzz below your inbox.. On clicking the tab, users can read status updates, photos and video. Buzz updates will also show up directly in user’s inbox as well as in a tab within Gmail. Further you can open an item to comment directly because it’s a live object with an open connection to the server that gets updates in all time. According to Google, 40 people whom users talk to through Gmail and Gchat will be automatically added as friends. Buzz uses information from the existing email accounts of users to automatically show updates and media from people they talk to regularly. However, it will also allow users to share information privately if they want. Status messages that users publish on Google Buzz and flag as viewable to everyone will be automatically indexed by Google’s search engine and be available within Google’s recently launched real-time search results. Like other social services, Buzz allows users to post status updates that include text; photos from services like Google’s Picasa and Yahoo’s Flickr; videos from YouTube; and messages from Twitter. I say many of its features mimic those of Facebook. This means Buzz will eliminate the need for people to visit sites like Twitter to post updates or see those sent by people they have selected to follow. Google Buzz will also pull in updates from outside your immediate group, such as an active conversation involving some friends and some people you aren’t following. However, though users can view Twitter messages within Buzz, they will not be able to publish new messages to Twitter’s service. Buzz is also tailored to work on smartphones. Buzz will be available on mobile devices including Apple Inc’s iPhone and those that run on Google’s Android software. The programme automatically includes contacts that a user frequently emails. Google’s buzz also lets users publish their ideas to the world or just to their closest friends. This means each update can be set to either a small group of friends or to the entire world. User’s private updates will be directed to Buzz followers while public updates will reflect on user’s Google Profile page. So some pretty cool features, so saying that do Could it be Twitter killer? the answer is No, because i thinks it co-exists peacefully. When you post a new tweet using Twitter, Google can import that tweet and send it out to your Buzz followers with the rest of your Buzz updates. You won’t have to jump through any hoops or use any back-door methods to make it happen. Twitter is officially supported by Buzz — the same is true of Flickr, Picasa, Blogger and YouTube. But the same is not true between Buzz and Facebook. Buzz doesn’t import your Facebook status updates. It doesn’t post updates to your Facebook feed. It doesn’t display your friends’ feed updates. There’s no Facebook Connect integration at all. Google is going to have a difficult time building a userbase when everyone who has a Facebook profile (that’s just about everyone who uses the social web at all now) is concerned that they can’t see their friends’ updates. They’ll have to keep using Facebook to stay in touch with their Facebook friends. With more than 400 million users, Facebook is the world’s largest social network; Twitter by contrast has only 18 million or so. Gmail’s unique visitors numbered around 36 million as of last year. Clearly, Facebook is dominating. Google is attempting to challenge that dominance with Buzz, but Facebook is at the same time planning to move just as aggressively into Google’s territory. It was recently discovered that Facebook will eventually launch its own webmail service. You can already send messages to e-mail addresses from Facebook, but the execution isn’t as smooth as it needs to be. The new e-mail plan would address that. So what are you buzzing now, let me know what do you like and don’t like about it… C U Next week, tell then happy buzzing…..